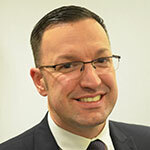 Luke Peachey is the Emergency Planning Manager for University Hospitals Coventry and Warwickshire (UHCW) NHS Trust. He is responsible for developing and maintaining strategic plans for preventing and responding to a vast number of emergencies. Luke is also responsible for reducing the impact of patients and the overall Trust during the response and recovery from emergencies. His initial career was spent working as a Senior Charge Nurse for 12 years in the Emergency Department, alongside ten years with West Midlands Ambulance Service and two years with West Midlands Care Team. Luke is fortunate to be able to utilise his clinical experience within his current role and uses this to understand how different services operates while planning for emergencies and the impact this could potentially cause.